This artistic and inspiring Find Rest Journal is the beautiful companion to Find Rest: A women's devotional for lasting peace in a busy life by Shaunti Feldhahn. With its scripture reminders and quotes, this journal is the perfect way to spend quiet time with God, remembering His biblical promises, and reflecting on your journey to find rest in the middle of a busy life. 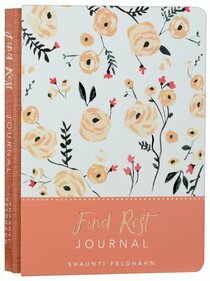 About "Signature Journal: Find Rest, Peach Flowers"
:This artistic and inspiring journal is the beautiful companion to the bestselling devotional Find Rest: A Women's Devotional for Lasting Peace in a Busy Life by Shaunti Feldhahn. Jesus promises us that we can find rest for our souls and feel a sense of peace even in the middle of our normal, busy lives. With its scripture reminders and quotes, this journal is the perfect way to spend quiet time with God, remembering his biblical promises, and reflecting on our journey to find rest in the middle of a busy life. This beautiful journal helps enable readers to come, think, pray and reflect and can be used alongside Find Rest or as a stand alone journal.